Find out what’s causing those unsightly squiggly lines that have marred your paint job—and learn how to remedy the situation. Q: I recently noticed a few cracks in our living room wall. I’m not sure if they’ve been there for a while and I just missed them, or if they’re new. Are cracks in the walls easy-fix cosmetic problems—or signs of a structural issue that will need extensive repairs? A: Wall cracks are fairly common in both new and older homes and are often the result of normal house “settling” that can quickly, inexpensively be remedied by re-taping the joints—the seams where the drywall panels meet. 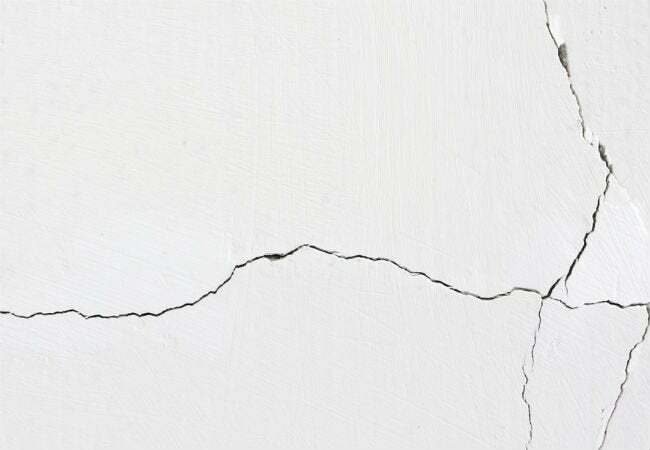 Occasionally, however, cracks in walls signify a larger problem that should be addressed before you attempt to repair the crack. Here’s how to determine if the crack is flagging a serious problem, and what steps to take to get your wall back in shape. If your home was recently built, cracks in walls could be the results of “new home” settling. New lumber, sometimes called “green lumber,” contains a high level of moisture and tends to move slightly as it dries out, so small wall cracks are common in newly built homes. It’s a good idea to wait a year after your home was completed before repairing any cracks. This gives the wood time to dry completely. After that, you can re-tape the cracked joints (see the last section below for how-to info) without worrying that more will appear. Hairline cracks over doors and windows are likely due to settling. Houses of any age move and shift subtly over time, and the weakest area in a wall is the most likely to crack. A wall is constructed with vertical studs that extend from floor to ceiling. The studs must be cut, however, in order to install a door or a window. While the builder adds extra framing to the adjacent studs, these areas are still weaker than the rest of the wall, and when settling occurs, these spots are the first to develop cracks. 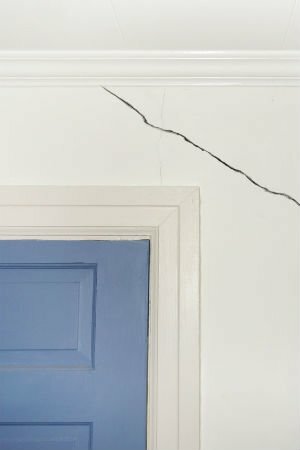 Hairline cracks across walls and doorways do not indicate a structural problem; they should simply be re-taped and painted. Leaving a house vacant can cause wall cracks. Vacation homes and those that sit empty for a few months are prone to developing cracks in both walls and ceilings. This is due to the house not being climate controlled as it would be if it were occupied. Fluctuations in temperature and humidity levels can cause framing members and drywall to expand and contract, resulting in cracking. Like other wall cracks, these can be re-taped and painted. A thin straight crack could be the result of faulty taping. When drywall panels are installed, the seams between the panels are filled with drywall mud and covered with paper tape. If the tape doesn’t have enough mud underneath to stick firmly, it can start to pull away from the wall over time. When this happens, you’ll see a fine crack where the tape has lifted. If there’s only one crack, try squirting a little household glue behind it and pressing it back into place. If the tape is lifting in multiple areas, however, your best bet is to re-tape all the seams because the problem will continue to recur. Discoloration around the edges of the crack indicates a leak. Water leaking from a window or the roof, or even a leaky attic water line, can run down inside a wall’s framing and saturate the drywall, which then softens and deteriorates, creating a crack with noticeable yellow or brownish stains. If the leak is fresh, such as from a recent rain, the area might also feel damp to the touch. Before fixing the crack, which will require replacing the damaged section of drywall and then re-taping, it’s important to find the source of the leak and repair it. Large, jagged, or diagonal cracks could indicate a structural problem. Jagged or diagonal cracks indicate that the foundation may have shifted or sunk, or another problem has occurred, such as the deterioration and collapse of supporting wood members due to termite damage. Likewise, cracks wider than one-quarter inch indicate a potential problem with the home’s structure. These cracks warrant bringing in a reputable builder or engineer to inspect your home’s structure and pinpoint the cause. Once the structural problem is resolved, you can make drywall repairs, which involve replacing the damaged drywall panel(s) and then re-taping the joints. The best way to repair a crack in drywall is to re-tape the joint. This involves scraping away the loose tape and crumbled bits of drywall mud, sanding the surface smooth, and then filling the crack with drywall compound and applying new tape. The trick to getting a smooth wall is to apply two to three very thin coats of drywall compound over the paper tape, and sand each coat after it dries before applying the next coat. Filling cracks with spackle is not recommended. The spackle does not provide the same reinforced surface coverage you’ll get by re-taping, and any slight settling will cause the crack to show up again. 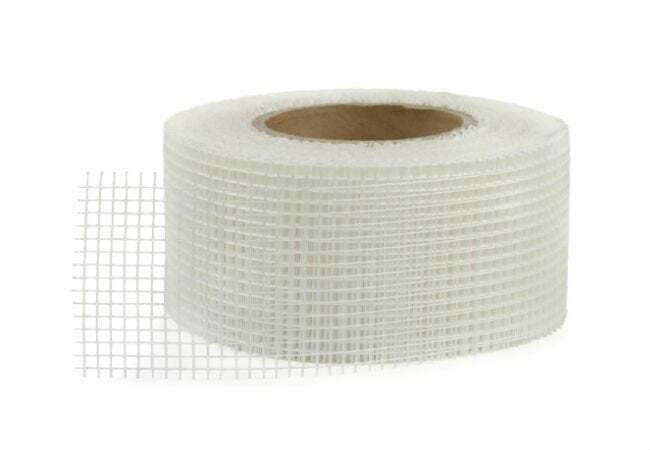 For long-lasting repairs, re-tape cracks rather than filling them with spackle.